US Chamber Of Commerce: Equal-Pay Advocates Have "A Fetish For Money"
The anniversary of women's suffrage is bringing all sorts of enlightened opinions out of the woodwork. Including the US Chamber Of Commerce blogger whose solution to the pay gap is to tell women to "choose the right partner at home." On the lobbying group's official blog, Brad Peck approvingly cites another writer, Don Boudreaux, who wrote, "Not only does achievement of such 'equality' require the state to treat people unequally, obsession with income equality also reflects a Scrooge-like fetish for money." Peck was so taken with the "fetish for money" phrase that he named his post after it. Boudreaux also wondered, "Why do so many 'Progressives' excuse – or even positively approve of – envy of other persons' monetary assets?" In other words, why are you so jealous of people getting paid more to do the same work? He compares women's situation in the workplace to two men, one of whom chooses to go to work a lot and the other one of whom likes to spend all his time in the gym. Peck uses the example to suggest that businesses shouldn't be penalized just because women insist on popping out babies. This would be the same US Chamber of Commerce whose resistance to climate change legislation was too extreme for several power companies, among others, and whose pro-business agenda has also extended to opposing health care reform and unionization. * 1977: US Chamber opposes amendment to Civil Rights Act that would ban discrimination against pregnant women. * 1978: US Chamber says pregnancy is a "voluntary" condition in its opposition to Pregnancy Discrimination Act. * 1987: Family Medical Leave Act "sets a dangerous precedent," according to the US Chamber. * 1998: US Chamber opposes Equal Pay Act because "work experience does tend to create greater wage gaps." * 2007: US Chamber opposes Lilly Ledbetter's court case for equal pay because "tear-stained testimony" prejudices against a defendant. Opposed the bill in Congress to right the wrongs against Ledbetter in 2008 and 2009 as well. * 2007: Chamber official pledges "all out war" against Family Medical Leave Act, and in 2010 made it a "priority" to fight in Congress. * Monday: US Chamber again cites pregnancy as a "voluntary choice." It is true that culturally speaking women are more likely to have to make the tough choices about work-life balance. But as we all seek to fit our values into a dynamic 24/7 economy, let's not overlook the obvious, immediate, power-of-the-individual solution: choosing the right place to work and choosing the right partner at home. I make an individual choice to tell Peck he's an idiot. 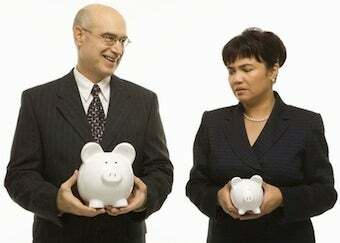 Does The Wage Gap Really Exist? How Do We End The Wage Gap?